The invasion of Broca Beach begins as the Blue Ninja forces, dressed as Fred-series Crimson Guards, advance towards Cobra Commander's headquarters. While their elite Vipers race home to protect their families, Cobra receives help from two unlikely allies. This is Larry Hama's eighth chapter in the Blue Ninja saga, and the story still feels fresh and captivating. He's been slowly building up the tension and the threat, from mere stories in issue #171, to the realization of the numbers and inhumanity of the Blue Ninja in the last issue. Just one of these Ninja gave the combined team of Storm Shadow and Snake Eyes challenge. What will a squadron of them, disguised as elite Cobra Guardsmen with a willingness to execute women and children, do to the town of Broca Beach? Larry's been building towards this moment since issue #171, and I am hanging on every panel. As an aside, it's an interesting twist for Larry to make Cobra the victims in this battle, and even more interesting to make us feel sympathetic for them. Admittedly, I probably have more favorite Cobra characters than Joe characters, but I fully accept the evilness of those Cobra characters, and rarely feel sorry for them. That elite troop of Vipers, which won my respect in the beginning of last issue, now has my full support as they race to Broca Beach to protect their families. While it appears to be a law that Snake Eyes is required to save the day in every conflict, I'm hoping that the Blue Ninja learn very painfully at the wrathful hands of the Viper squads that killing Cobra's family members was the mistake that led to their downfall. I mentioned in the review for the last issue that the Baroness seemed to be a shadow of her former self since the relaunch, and that I hoped Hama would return her to her former glory. He, and she, did not disappoint. Intelligent, witty, calm under fire, and possessing the grace of someone who knows that the most important person in the immediate vicinity is herself: these are the qualities that we loved about the Baroness, and they are all here in this issue. I've also mentioned in previous reviews how tiresome Snake Eyes can be as a character, for much of his development depends on whomever he is interacting with. When he is paired with Helix (someone who is devoid of overt emotions and idolizes Snake Eyes), his characterization can become dull to the point of being excruciating. While the team-up between Baroness and Snake Eyes has been foreshadowed for a couple months now, what was unexpected is how good their pairing seems to be, especially considering (or maybe because?) of the long history the two characters share. Baroness has so much personality to spare for the both of them. It's refreshing to see someone else take the driver's seat in a team-up with Snake Eyes for a change. 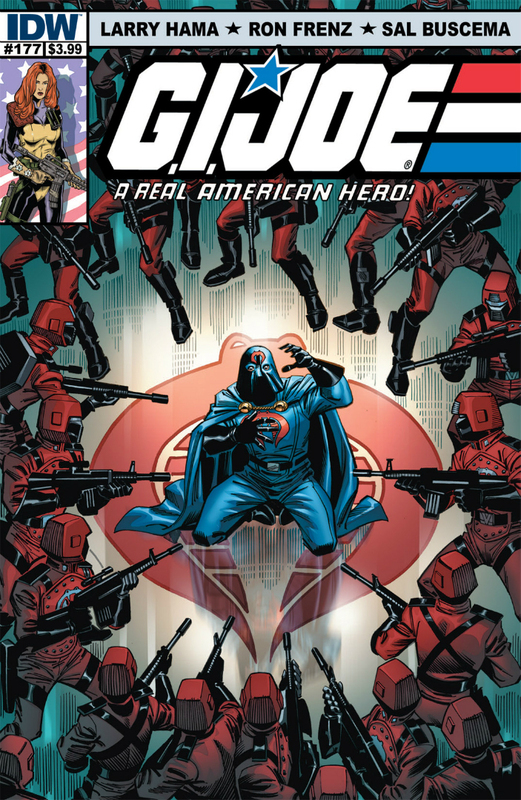 Ron Frenz returns to G.I. Joe: A Real American Hero after last helping out with this year's annual. Whenever there is a change in artists in a book, it's next to impossible not to compare the current artist's style with the previous artist. Especially when that previous artist is S.L. Gallant, who has done much recently to set the look and tone for this book. In comparison to Gallant's, Frenz's work is more linear and angular, which isn't bad, just a little jolting for someone used to Gallant drawing these vintage characters. Taking Frenz's work on its own, though, he excels in dynamic storytelling: he characters are expressive and seem full of motion. While I'd love for Gallant to stay on ARAH as long as possible, having Frenz as an alternative is more than fine with me. "Snake Eyes is on our side in this particular fight. Or at least he's on my side, but I suppose you are covered by proximity..."
The seeds Hama has planted eight issues ago are coming to fruit with this issue. The players are in place, the tension is high, and the stakes are even higher. A fun and exciting read. Recommended.